June 17, 2014, 10:59 a.m.
Angela Merkel reportedly wants Jean-Claude Juncker appointed as European Commissioner “as soon as possible”, in the latest blow to the Government’s bid to keep the Luxembourgish politician out of the top EU job. David Cameron has expended considerable political capital pushing for an alternative to Mr Juncker, a traditional European federalist whose appointment the Government believes would seriously jeopardise their ambitions for renegotiating Britain’s relationship with the European Union. At the same time however, the British public are increasingly positive about staying in the Union – according to research into how people would vote in an in/out EU membership referendum. YouGov’s latest poll for The Sun finds an eight point lead for those who want Britain to remain in the European Union, the largest lead recorded since YouGov first asked the question in September 2010. 44% would now vote to stay in the Union, while 36% would vote to leave. YouGov also asked people how they would vote in the event David Cameron successfully renegotiates Britain’s relationship with the European Union. 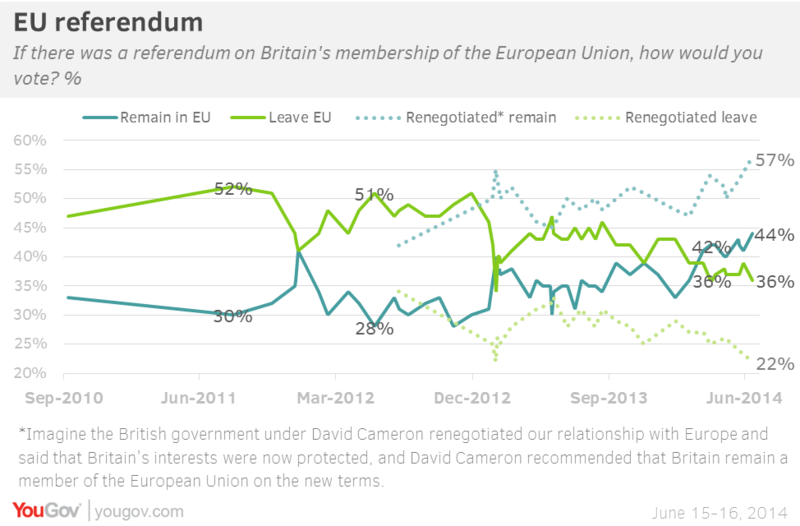 In this situation, ‘remain in’ surges to a 35-point lead – the largest since the question was first asked this way in June 2012. The prime minister has promised that if the Conservatives are re-elected to government next May, Britain will have an in/out referendum on EU membership in 2017, but blowback over Mr Juncker’s appointment could mean the vote comes even sooner.